Description: Fabric is a First Person Puzzle Game with bending and squeezing mechanic to solve the challenging puzzles and complete the glitchy voxel-based levels. Your goal is, basically, to reach the end of the level. To achieve this goal, you won’t need to collect numerous of items, won’t craft anything absurd or won’t try to persuade any chatty AI: In Fabric, you will change the shape of voxel-based levels and physics with your gun. This gun allows you to bend space, squeeze the world, separate tiles from each others and bring them together. anyway. i know nothing about programming but i like very much playing games, especially puzzle ones. so my comments will be mostly cosmetic. first thing i noticed is view elevation is to weird. i feel like there is no distance between the eyes and the ground. creepy. secondly (i said i know nothing about programming) graphics are not quite interesting… also i havent but it seems it is easy to get lost in the maps. may be a compass or or some marks on the walls to distinguish the way points would be useful. please dont feel my comments are offensive but there is not a revolution in the game. it really felt like i am in an antichamber teaser ( i bet you have played and liked too much). Great game! Found the dimension squashing puzzle mechanics to be very unique! We’d love to feature it on the Alpha Beta Gamer website if you’re interested? Thanks for motivating comment. We’ll be grateful for any review and being featured. Especially in these early stages of development. Pingback: Fabric | Get Game Beta! What an amazing game! Though the grafics are really simple, but I really dig the style. Gameplay mechenics are terrific, gotta love the smarts. Not too much contributive advice,just my praise at the moment. Great game, I’ll be back if I’ve got something to actually say than random ramble. Pretty cool game! 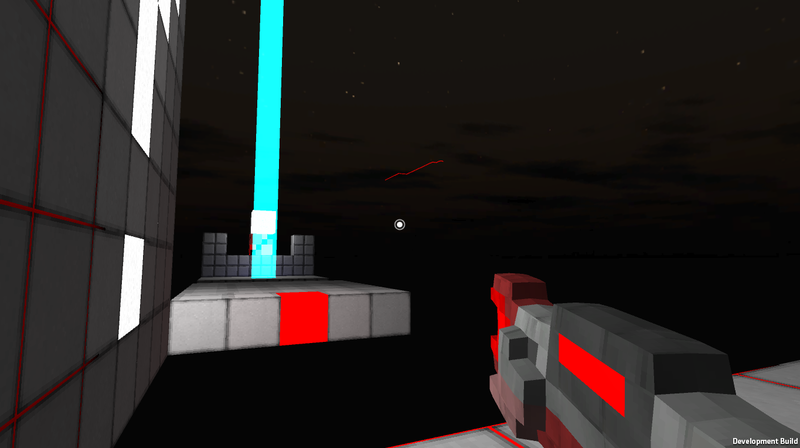 I was confused at first with the gun mechanics, but after some experimentation it seems like clicking two boxes connects two separate level constructs, and right clicking (maybe within the red highlight radius) detaches the constructs. I think the “bzzzt” sound is okay, but I don’t like getting freezed when the level goes “bzzzt”. There’s an early level where the “bzzzt” is periodic and it was kinda annoying to hear the “bzzzt” all the time. But overall, the game feel is really good! Amazing game & game design. Not sure if this project is inactive or not, but I’d like to post a review anyway. If it is indeed still active, I encourage continuation. + The entire everything about the game looks awesome. You feel like you’re in a computer simulation of some sort. If that’s what is intended, then you have succeeded tenfold. The other levels that seem to appear off in the distance and then glitch out do not confuse the player as much as contribute to this aesthetic effect. + The beams that appear and sound effects that occur when you attempt to merge two blocks while standing between them is quite awesome. + Unique enough a concept that I can’t name any other game that this could be claimed a clone of. That is to say, I can’t say with certainty that this (merging using special blocks) is an unexplored concept, but I can say that this is the most memorable game using this concept thus far. + Mechanics are smooth and intuitive, from my playthrough — however, I found this game from a Youtube video (www.youtube.com/watch?v=7A6Irfult0k) in which they did not seem to understand that they cannot stand between blocks when merging them. May want to incorporate a tutorial level, or improve upon whatever level you may have added in to enforce this concept. + Puzzles are fun. Not to say they’re easy, not to say they’re hard — some are one and some are the other, but all are fun. – Game music cuts out abruptly when falling into the void prior to resetting at from where you fell. Suggestion: Continue music, and perhaps add in a death sound. – Sound of merging gets repetitive. Suggestion: Have several slightly different sounds, of which a random one is played when you merge, instead of the same sound. A simple change in pitch, for example. – Merging in such a way that you fall leaves you in an endless loop. * Change cylindrical beacon at exit blocks to fit more with the squarish/cubish theme. Perhaps pixilate it. * An action counter, to count how many times you have merged blocks in that level. The ultimate goal of each level would be to reach the end in as few merges as possible. So, I got stuck at level 20 (or 21, can’t exactly remember), and pressed R. After which, instead of restarting the level, I restarted the entire game at level one. And, the two levels (level 1 and level 20) had seemed to have merged. When I progressed from that point on, it took me to level 2, and I experimentally restarted again to find levels 1, 2 and 20 combined in a weird fashion. A lot of experimentation later accompanied by a blown mind (because though it breaks the puzzle function, it is incredibly cool to see the true glitchspace of a game set in glitchspace), I can only dependably say you have a bug to fix. So,I also think its quite good as others. Looks original and well made. Nothing much to add for me. Just would like to mention that when you pause it while looking at map, it gets little bit bugged but still you can get rid of that with unpausing. Also even though the map logic and graphics looks quite good, i would suggest to change it to something simpler, so that one understand how many red blocks there are, where we should go and where we are at the moment a little bit easier.Good luck on rest. I want to add a one more suggestion. I think this game lacks some distractive features.Not something big but small details.Like those effects on sky.Simple things to waste time on rather than rushing to finish, since there is no time limit. Güzel olmuş elinize sağlık. Var mı bilemiyorum fakat koşma olsa daha iyi olur. Bir süre sonra daha hızlı hareket etmek istiyor insan. When you reach level 9 there’s a bug where the level repeats itself. Other than that, this game is awesome! Hope you guys get somewhere.